The Tamiami Airport Moves to its new and current day location. The original Tamiami Airport was established in the mid-1940’s and was located just southwest of Miami International Airport. By the mid 1950’s it was an active general aviation airport with three paved runways that serviced several aviation businesses. However, by the mid 1960’s, the jet era and its proximity to Miami International Airport sealed the facility’s fate. The airport was relocated further south and the new Tamiami Airport opened in 1967. 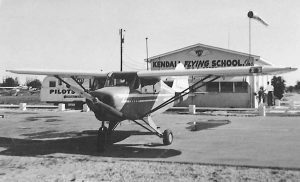 The Florida International University campus absorbed the original Tamiami, and the new facility was later renamed Kendall-Tamiami Executive Airport.